The gumdrop-shaped capsule arrived ahead of schedule, and Japanese astronaut Akihiko Hoshide used the space station's robotic arm to grasp the craft as it hovered about 30 feet beneath the outpost. Grapple occurred at 6:56 a.m. EDT (1056 GMT). "Looks like we've tamed the Dragon," radioed space station commander Suni Williams. "We're happy she's on-board with us. Thanks to everyone at SpaceX and NASA for bringing her here to us, and the ice cream." One of the final items loaded into the Dragon before launch Sunday was vanilla-chocolate swirl ice cream housed inside a freezer designed to protect experiment samples. Under the control of astronauts and ground controllers, the robotic arm carefully maneuvered the spacecraft in position on a berthing port on the Earth-facing side of the station's Harmony module. 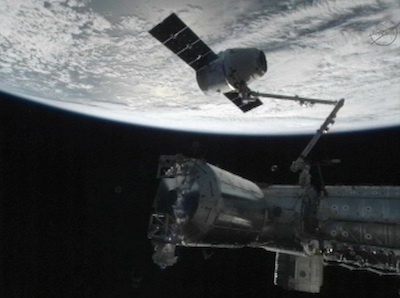 Bolts mechanically drove into place to make a firm connection between Dragon and the space station at 9:03 a.m. EDT (1303 GMT). Because of the quick pace of the rendezvous, astronauts moved up the hatch opening to the Dragon from Thursday to Wednesday. Williams, Hoshide and Russian cosmonaut Yuri Malenchenko opened the hatch to Dragon around 1:40 p.m. EDT (1740 GMT). "It was great to get into Dragon," Williams said. "One of the most interesting aspects of this vehicle and its follow-ons will be that it can bring stuff back to Earth," Williams said. "This vehicle right here has a freezer, which we're all anticipating and excited about going in to see what's in there that came up here." NASA and SpaceX put the ice cream in the freezer just before launch. "But more importantly, it's going to be bringing back samples that have been taken over the last couple of years of people living up here, and that's really important for the advancement of spaceflight," Williams said. "So congratulations to the SpaceX team, again [its] an amazing vehicle. Congratulations to the U.S. space program for this next step." The capsule's delivery is the first operational resupply flight operated by SpaceX, one of two companies picked by NASA to provide commercial cargo services over the next few years. The other firm, Orbital Sciences Corp., aims to begin service next year. SpaceX's deal with NASA, signed in December 2008, covers 12 flights and is worth $1.6 billion. "I think this is tremendously important," said Bill Gerstenmaier, NASA's associate administrator for human exploration and operations, in an interview aired on NASA TV. "When we retired the shuttle, we needed a way to get scientific investigations as well as necessary supplies, crew equipment, food and other things to and from space station." NASA signed agreements with SpaceX and Orbital Sciences to provide government funding to speed up development of new rockets and cargo vehicles. SpaceX received $396 million from NASA from 2006 to 2012. "This is the first commercial flight where we're buying essentially services to carry up things to orbit," Gerstenmaier said. Dragon's pressurized compartment is packed with 260 pounds of food, clothing and other crew equipment, 390 pounds of experiment hardware, 225 pounds of vehicle equipment, crew health components and life support system parts, and 7 pounds of computer gear. Dragon is scheduled to stay at the space station until Oct. 28, when it will be released from the robot arm and head for re-entry and splashdown in the Pacific Ocean west of Mexico. The ship's departure date could be adjusted. The SpaceX-owned capsule is the only vehicle currently capable of returning significant equipment to Earth. Other cargo freighters from Russia, Japan and Europe burn up on re-entry. Russia's crew-carrying Soyuz spacecraft only has very limited cargo return capacity when it lands with astronauts. "Probably the most important thing from this flight is this will allow us to return some samples from space station," Gerstenmaier said. "There's a GLACIER freezer that's on-board as well as some cold packs that are in the Dragon capsule." Vials of blood, urine and other biological samples accumulated since the retirement of the space shuttle in 2011 will be returned inside Dragon. "These are unbelievably unique and precious specimens," Gerstenmaier said. "Locked in these frozen samples is potentially information that can reveal a lot about what microgravity ... is like in a biological sense."